I don't really celebrate Earth Day because it comes only once a year. Instead I try to limit my footprint every day by recycling and reusing. And I have to give my employer credit because they have even changed from providing styrofoam cups to giving us all reusable ones (though I was already bringing my own). 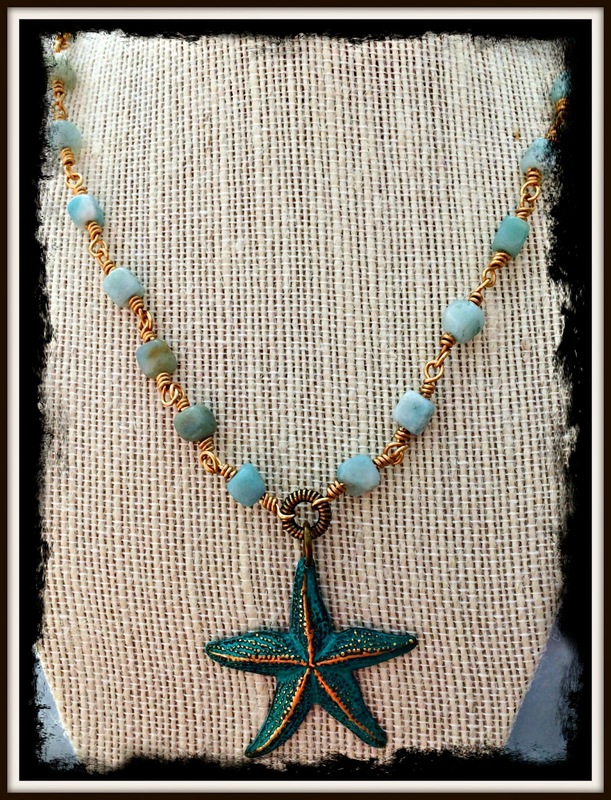 This necklace today really reminds me of being under the sea with the aged Starfish from Patina Queen. I then added a handmade beaded chain made using aquamarine stones and brass wire. This is a necklace that I do have for sale for $39.95 so if interested please drop me a line. And for more Under the Sea beauties be sure to stop back on Thursday for the Deep Waters blog hop. I will have another necklace to show off then.